The slow move away from a fee-for-service payment model toward value-based reimbursement in recent years has for many healthcare providers been a key incentive behind their focus on exploring different ways to improve the health of the communities they serve. For organizations like New York City-based Montefiore Health System, population health management has been a part of its business model and care delivery strategy for the past two decades. The health system began taking on risk-based contracting for patient care in 1996, and now has more than 20% of its net patient revenue tied to such payment models. Having a financial stake in keeping patients out of the hospital has helped build a trusting relationship between the provider and community stakeholders, said Nicole Hollingsworth, assistant vice president at Montefiore, adding that those relationships have been the foundation for effective preventive health and wellness outreach. As providers increase their population health efforts, learning how to identify and sustain relationships with community stakeholders is essential for successful interventions. But many still find establishing such a partnership a challenge. "As soon as you become completely responsible for the total cost of care for patients and you are a health system that has a lot of different settings, you bring together two of the most important ingredients to change hearts and minds about how a health system should be interacting with a community," Hollingsworth said. They are relationships that the system remains vigilant in maintaining even after so many years. "I think one of the biggest fallacies in community work is assuming just because we're here that means we're partners with the community," said Dr. Amanda Parsons, Montefiore's vice president of community and population health. "Trust has to be gained for everything that we do." 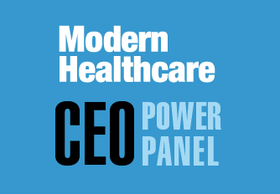 But developing strong relationships for the purpose of addressing the various elements of population health is among the more daunting challenges facing providers, according to respondents to Modern Healthcare's latest CEO Power Panel survey. 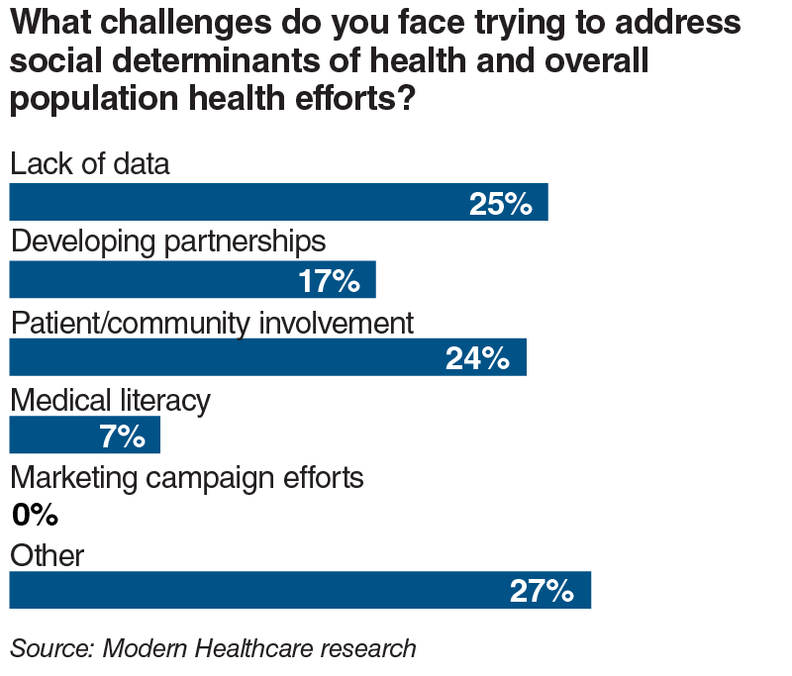 Nearly half of the 70 healthcare leaders and executives who took part in the quarterly poll identified either developing partnerships or a lack of community and patient involvement as the most significant barrier to confronting social determinants of health. "Addressing social determinants requires developing strong community partnerships to resolve issues such as housing and unemployment," said Randy Oostra, CEO of northwest Ohio-based health system ProMedica. "Often community resources and programs to address these issues may not exist." Hollingsworth said providers that seek to develop community partnerships must think about such relationships as a part of their overall business strategy rather than a form of charity, or a public relations or goodwill stunt. "It has to be something you're invested in and something you're invested in over the long haul," she said. 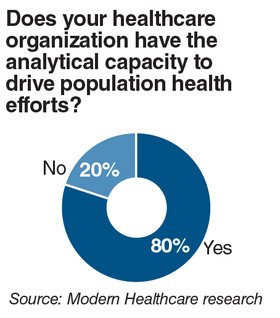 The third-quarter survey indicated that addressing population health management is top of mind among healthcare leaders. 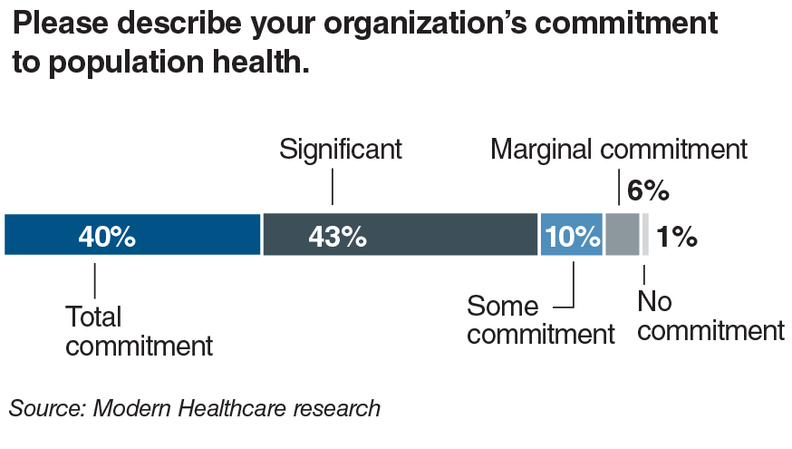 More than 80% of respondents reported that their organizations had a total or significant commitment to a population health strategy. 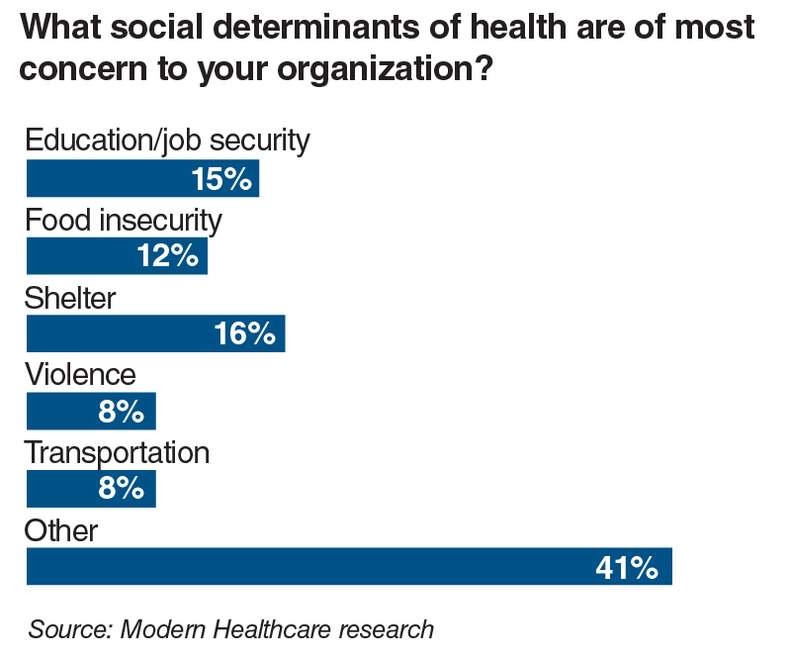 Homelessness and a lack of employment opportunities were rated the top two pressing concerns in terms of their impact on patient health. 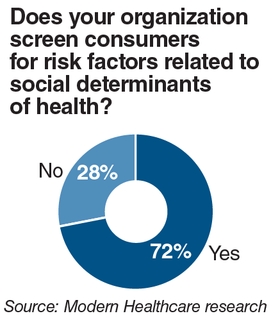 But respondents also said that a combination of all determinants was a concern. 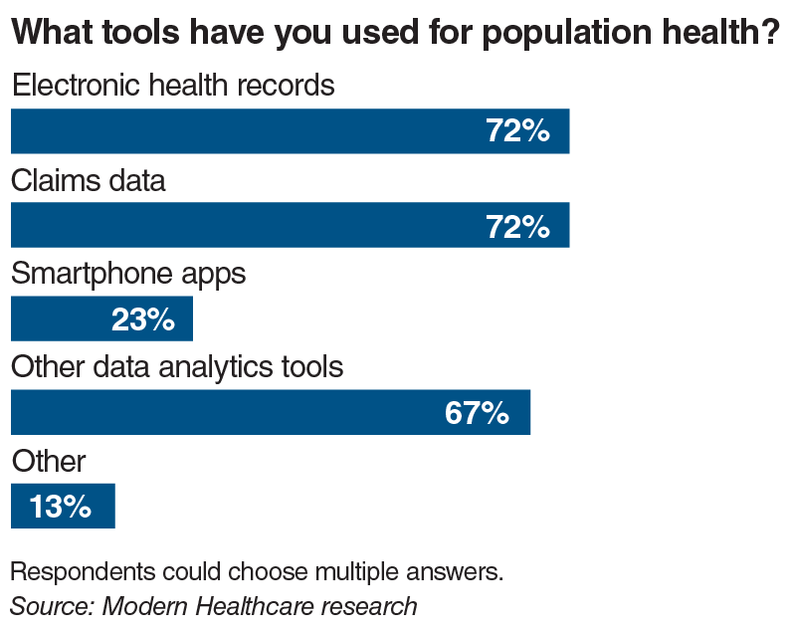 Two-thirds of respondents said they used clinical outcomes to determine how effective their population health efforts have been, while 56% used reductions in costs and 54% tracked declines in readmissions as metrics for their performance. "Good health requires more than just access to high quality healthcare," said Dr. Jay Shannon, CEO of Cook County Health and Hospitals System in Chicago. In 2015, the system launched a program in partnership with the Greater Chicago Food Depository to provide food insecure patients with access to produce via a food truck that travels to various sites around the city. As of June, the program had distributed more than 138,000 pounds of fresh produce to more than 5,100 individuals. "We understand the need to develop strategies that become part of our everyday practice," Shannon said. An increasing amount of evidence supports the argument that socio-economic factors play a vital role in impacting the health outcomes of communities. A 2014 study published in the journal Public Health Reports found that men who graduated college by age 25 had an average life expectancy that was nine years longer than men who had less than a high school diploma at the same age. The same study found 32% of adults over age 25 with incomes below 100% of the federal poverty level had an activity-limiting chronic disease compared with just 9% of adults with incomes at or above 400% of the poverty level. Increasing regulatory pressures also have played a part in driving more healthcare organizations to focus greater attention on improving community health outcomes. Under the Affordable Care Act, not-for-profit hospitals are required to conduct community health needs assessments once every three years and to put an action plan into place to address shortcomings discovered in the assessments or risk losing their tax-exempt status. 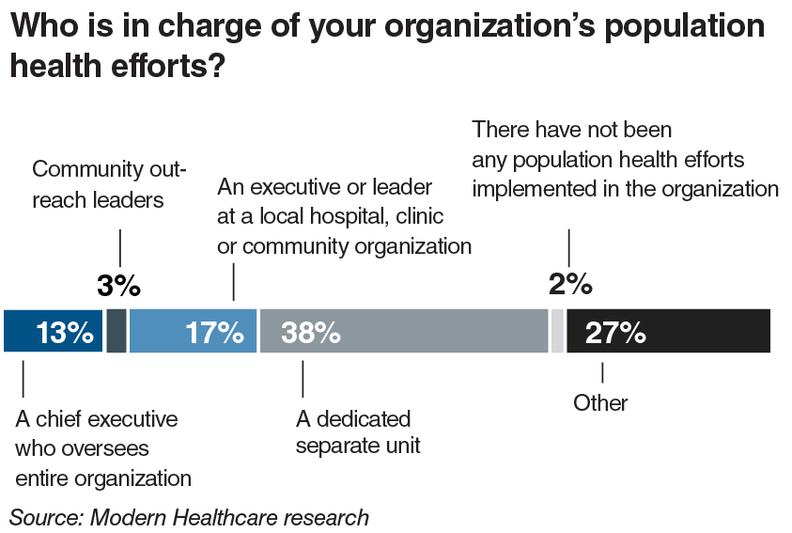 Power Panel survey results indicated healthcare leaders favor approaches that incorporate an array of entities when finding and developing community partnerships, but are still mainly focused within the industry. 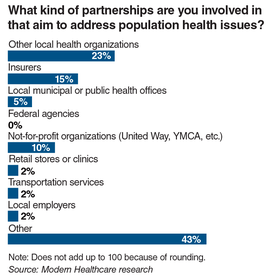 In choosing a partner, 23% of those surveyed stated they tend to seek other healthcare organizations to collaborate, followed by 15% noting they work with health insurers. "The fact is, it requires real interpersonal relationships as opposed to business connections, or something that's more formalized," said Hilary Heishman, senior program officer at the Robert Wood Johnson Foundation. She said healthcare providers seeking to build partnerships with nonmedical community groups must first understand and acknowledge how their organization is viewed within that community and make efforts to address any negative perceptions. "Communities tend to have a long memory," Heishman said. "If in the past, you haven't done much in terms of partnership or have done limited partnerships, or if people felt wronged in some way by something your organization has done, those things still matter." One strategy that has worked for providers like LifePoint Health is clearly stating upfront the objectives and expectations of any population health initiatives and finding common ground if those priorities are in competition with those of a community stakeholder, said Dr. Rusty Holman, chief medical officer of the Brentwood, Tenn.-based health system. He described LifePoint's approach toward engaging potential community partners as casting a "broad invitation" to a range of different entities. "Defining the problem and making it clear is an important initial step," Holman said.